The complimentary breakfast at the West Park Inn was adequate, perhaps best classified as ‘perfunctory and packaged’. 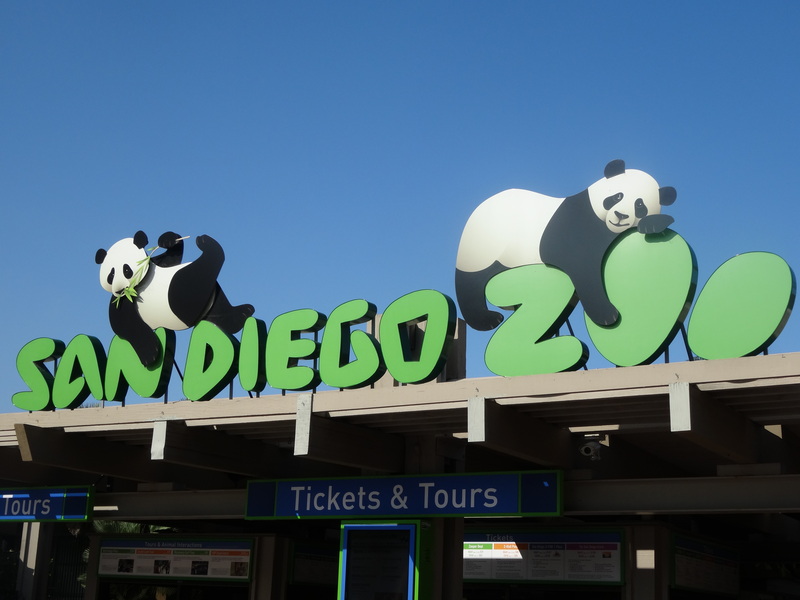 A ten-minute drive through the scenic and impressive Balboa Park had us at the entrance of the San Diego Zoo by around 9am. We were a little early for the first of our two appointments for behind-the-scenes experiences which Jenny had arranged through her contacts at the Melbourne Zoo, so we grabbed a coffee and studied the extensive and detailed Zoo map. While there, we heard this singing…it sounded straight out of a Disney movie…immensely cheerful and positive…imparting the lessons of how to be happy every single day of your life. 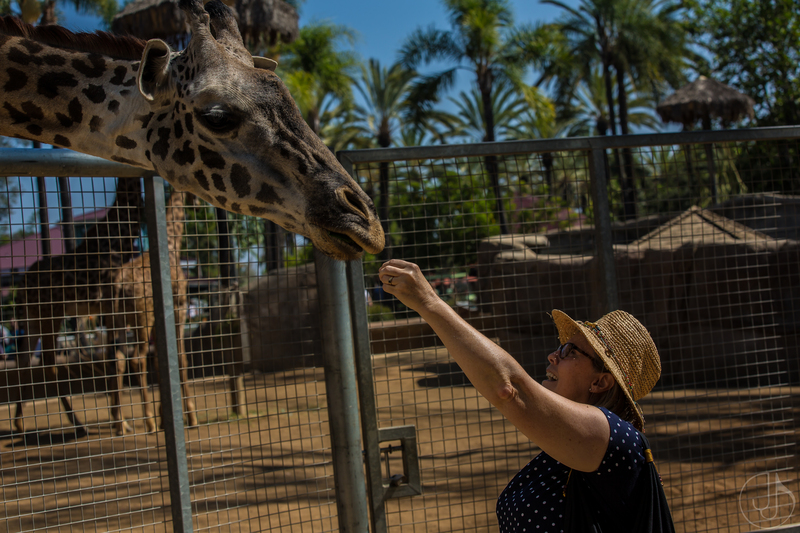 Suitably enlivened, we walked to the giraffe enclosure where we met keeper Erica who was kind enough to take us around the back and give us the opportunity to feed the giraffes with a snack treat of lettuce leaves. We then arranged contact with keeper Jane at the Elephant Centre. 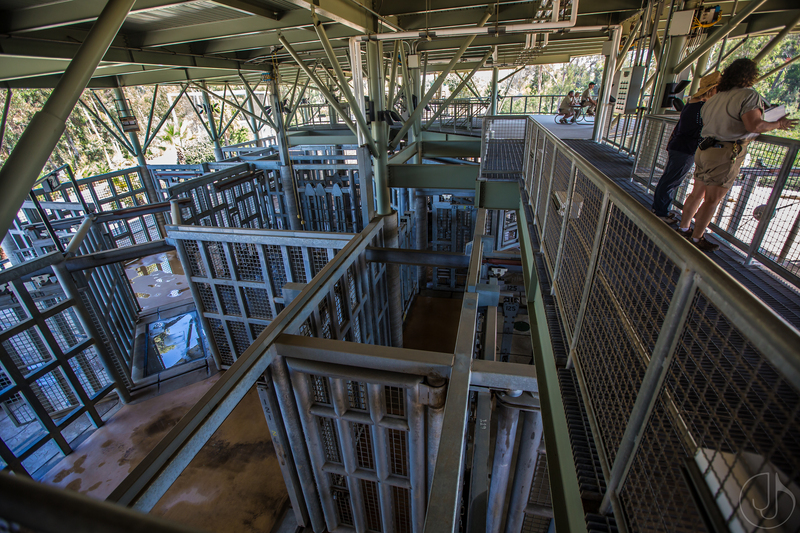 This $40m facility is pretty new and highly impressive – enormous walled sections for elephant washing, feeding and separation. Giant brushes for the elephants to walk under end to give their backs a good rub, concrete trees that are no-maintenance and so useful for shelter and feeding. All up, we were there about thirty minutes and learned a great deal about the herd which was a mixture of Asian and African elephants. Other highlights of the day included humming birds, a very small relative of the African elephant (the Hyrax), condors, eagles and those crazy, spindly pink flamingos. A return trip on the chair lift was fun, as you get a terrific view of the entire complex and other parts of Balboa Park. 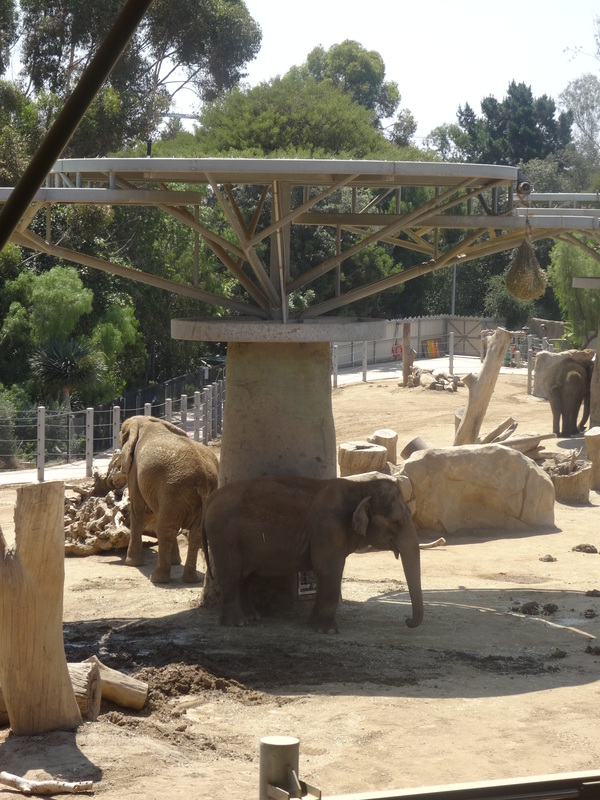 It certainly is a well-supported and landscaped zoo, no wonder it is considered one of the best of its kind in the world. By about 5pm, we were done. While there are many buses that travel around most parts of the grounds, we didn’t want to take the chance that we might get an omnibus without a singer at the helm. So, we walked our way around all day and our feet by this time of the evening were crying for relief. Back in our car, we decided to cruise down by the water to get a quick idea of that part of the city, as we would be leaving very early the next morning. We saw the USS Midway aircraft carrier taking many visitors, plenty of convention centres, many bars and restaurants, and crowds heading to a stadium right in the heart of downtown. Dropping the car, we hobbled our way back to the Gaslamp and parked in the first sports bar we could find, at least ten screens all going at once. We ordered a few appetizers, with craft beer and margaritas. The food with one exception was surprisingly excellent. Coincidentally, the San Diego Padres baseball team were playing in town where we saw the crowds a little while before, and the San Diego Chargers football team were also live on-screen. Consequently, there were plenty of interested local sports fans and a good night for us visitors to be there to soak up that atmosphere. The semi-chilled red wine on tap is, however, an acquired taste.